Stepping through the beveled corner, art deco inlay, looking glass, into the world of woodworking is an experience that is humbling to say the least. 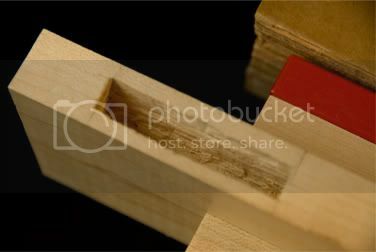 On another woodworking site, a blogger posed the question, are ‘Dovetails’ overrated? The article was well written, the comments were astounding. The debate between the pro-tail vs. the pro-choice factions was more contentious than an abortion debate three days before a presidential election. Wonderland indeed! The one point that I took away from the debate was that choosing to learn to cut dovetails by hand required a lot of practice and patience. As someone who revels in his obsessive compulsive side, this epiphany appealed to me more than pizza and beer on a Saturday night. Admittedly I am not a huge fan of beer, but I LOVE pizza; And I didn’t want say ‘Pizza and Diet Dew’, lest any readers think I am a big sissy. As I cracked a diet dew, I decided that I would begin my study by buying a chisel. My general rule is to always buy the best I can find. My knowledge of chisels was limited to knowing how to spell chisel, and I only recently learned that. The internet pointed me towards Lie-Nielson. Several other articles taught me that socket chisels are nice because the handles are less prone to splitting. Apparently the steel should be around 60 – 62 something, so it is not too soft and not too hard. This sounded like a fairy tale about 3 bears and a porridge stealing juvenile delinquent. But who am I to question the wisdom of those who come before me?! Lie-Nielson chisels are of this design. I felt smarter just for knowing that. I decided that I wanted a set of bench chisels, a fish tail, skew chisel and possibly a 3/8 mortise chisel. They only cost $555.00. With my brand new 3/8” Irwin chisel (around $10.00) in hand, I took the old mallet I had found in the garage, and tapped it gently into my practice wood. The Lie Nielson will have to come at a later date. The practice wood was a lovely little piece of hard maple; she had a nice figure and was a bit shy. I could tell it was her first time too. As I tapped that wood with my tool I felt nervous. Was I doing it right? Was I hurting my lovely piece of wood? Was it good for her? An hour later I had finished. I had drilled and chiseled my way to my first mortise. I was sweating but filled with joy. Oh the euphoria. So this is what all the fuss is about! I had chiseled out a 2 and ¼ inch by 3/8” mortise and was now ready to think about moving onto the tenon. Of course, this would have to wait for another day, as I wasn’t ready for another go. I just wanted to bask in the glow of my first mortise. I learned several interesting things about chisels. They are able to remove much thinner and cleaner shavings of wood than I would have imagined. I had assumed that they would take large chunks of wood with each hit. As I pared down the sides and brought the corners to 90 degrees(ish), the need for mastering hand tools became clearer than a D flawless diamond and quite possibly more valuable. I know now that if I can learn to use these wonderful tools, if I can make them do my bidding, then I just may be able to create a masterpiece or at the very least, a nice cutting board. It is ironic that, two days before, I had been thinking how I might use my plunge router to cut the mortises I would need for the Krenov saw horses I was attempting. I still believe that it will be equally important to be able to cut them with power tools, and I will likely cut far more using a router than I will a chisel, in my lifetime. But I doubt that I will feel the same exhilaration. So I discovered the joy of hand tools. I have since cut 7 mortises (4 without a drill) and 7 corresponding tenons by hand. The last 2 mortises (no drill) took less than 26 minutes each, which was a vast improvement over 1 hour. As I continued to meander through the wonderland, I happened upon a rabbit that said, “You should probably learn how to sharpen your chisel” and he winked. The wink made it seem dirty somehow. As I thought about the rabbit, I realized that this is why this journey is such a joy. Each day brings a new challenge. Each challenge opens a door. Each door leads to a hallway with more doors. I doubt I will ever find my way back to the mirror. I must have missed your first posting and I will be the first to say “I do have bad spelling” but it is getting better….I hope. On LJ’s I do think we as a whole agree if you have nothing nice to say keep quiet. We like keeping LJ’s a friendly community. I think that you should just cut your mortises with a router. It seems like a lot less hallways and doors to open that way. And mirrors are overrated. you got style , my man ! and we will all be enriched for it ! 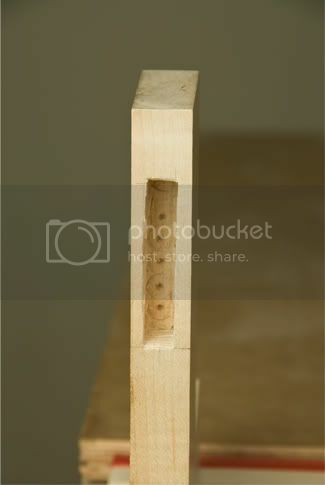 Brian, this is a pretty good mortise, especially given that it was hand cut. I enjoy seeing hand skills developed as you are doing and have made myself a promise that I will work on mine, which I will freely admit to having long neglected them. Another great post. I am currently working on building a pie safe. There are quite a few mortise and tenon joints on it. I still drill the mortises on my drill press and clean them out with chisels. To be honest, I enjoy doing it this way. It’s just a hobby for me. My customer, in this case my wife, is very patient. Also, I am building it from pine, so it almost feels like I am cheating since it is like chiseling putty. Hey – you are improving. As of this post, your comment rate is soaring to over 9.23%! Your writing is pretty good too. “And I didn’t want say ‘Pizza and Diet Dew’, lest any readers think I am a big sissy.” Ha, that’s funny. Not that your dapper hat would lead to any conjecture. Hey just kidding. Whatever your persuasion is welcomed here. Most folks click on and scan a post or blog, and move on to the next. I read more than a line or two in yours because (1) it has pics and (2) I wanted to hear how you explained that mortise. Just think what a zen moment you will have with a Lie Nielson in your hand. I have heard rumors that just the mere threat of a LN chisel on the bench will make a mortice straighten up and fly right. Let us know how those LNs work out for you. Lumberjocks is a great place to learn about sharpening those LNs, also. Welcome aboard.